This year we’ve hosted a variety of guest posts from library staff around Canada. For the last post of the year we are delighted to feature the Westmount Public Library, also known as Bibliothèque Publique de Westmount. 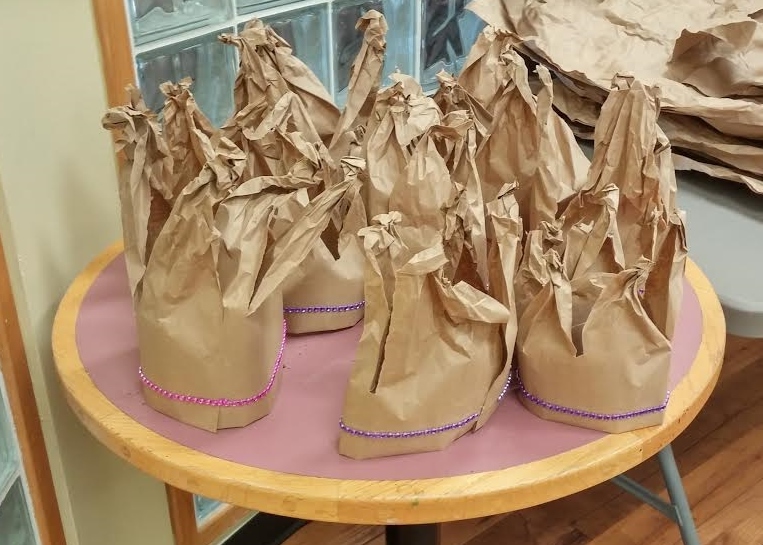 Our guest blogger is Children’s Librarian Wendy Wayling who is here to tell us all about a very special Summer Reading Club in Quebec! Just when the rest of the library is winding down and looking forward to those lazy, hazy days of summer, children’s departments all across the country are gearing up for their busiest time of year – the season of the summer reading club! And the Westmount Public Library is no exception. We have been hosting a summer reading club in our library for decades, but in 2011 we joined the TD Summer Reading Club to share ideas with librarians across Canada. Over the past years we have enjoyed successful summer reading clubs using such themes as science, mystery and fantasy, to name a few. This year our theme focused on play. Choosing a theme as versatile as play left the door open for so many possibilities allowing our staff to brainstorm and come up with some terrific ideas. I had been playing with the idea of transforming our department into a giant Candyland game when another idea hit me: What is the quintessential children’s book about play and imagination? : Alice’s Adventures in Wonderland by Lewis Carroll of course! The choice was no coincidence, however, as the classic children’s book is celebrating its 150th anniversary this year. 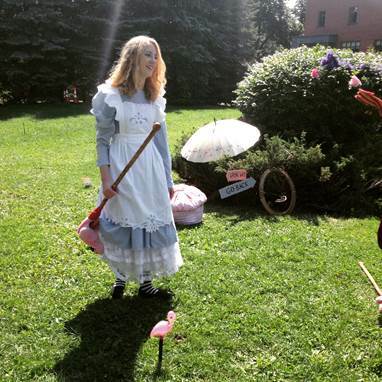 This year’s theme was of particular interest to me as Alice has always been one of my all-time favourite books, as a child, as a teen and even now as an adult. 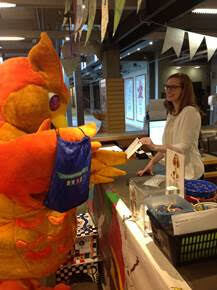 Our new library mascot, Findlay Featherton, joins the TD SRC! 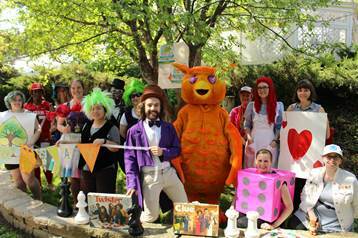 What better way to celebrate play and imagination than through the discovery, rediscovery and sharing of Alice and her wonderful adventures down under! 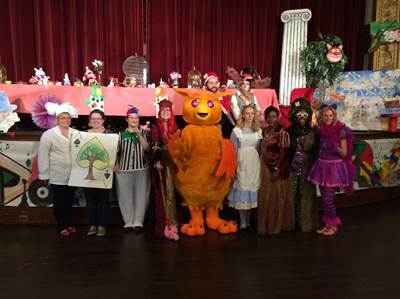 Our team got busy preparing reading-incentive games and activities based on play and Alice. Asking children to keep track of the time they spend reading can be a challenge and understandably so, as not many of us want to set a timer each time we sit down to enjoy a book. Over the years, we have tried to make this aspect more enjoyable for the children by creating some fun reading-incentive games, giving out small weekly prizes throughout the summer and carefully selecting a gift book to give to each child who reached his or her reading goal. Tech-free day at the library! In Wonderland, Alice met a Mock turtle – a character named after soup! Look up books about making soup! Boil it in a cauldron for 3 leap years until it is the colour of mud and serve it with dragonfly wings. Find a biography about our very own Queen Elizabeth II who, by the way, is nothing like the nasty Queen of Hearts! How old was Queen Elizabeth when she was crowned Queen? Did you know that she visited Westmount in 1959! 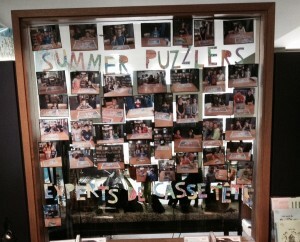 Besides the games and clues, we have also tried to transform the entire department each summer according to the theme. We do this with the amazing talents of the library staff and our local teen volunteers. I have been consistently blown away by the enthusiasm and artistic talents demonstrated by the teens. It is a treat to see how proud they are when they drop by the library to see their artwork on display. 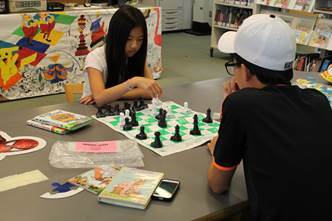 Partnering with local teens is a fantastic way to keep this busy age group engaged at the library. The desk murals painted by a staff member and local teen volunteers. Of course, we wanted to highlight other aspects of play: we invited the children to learn how to lawn bowl with the staff and the local lawn bowling club; we hired a local Irish musician to perform in our storytelling garden; we created birdhouses based on the TD SRC illustrations; we offered two Minecraft sessions; we played croquet in our local park dressed as the characters from Alice’s Adventures in Wonderland; and perhaps the most shocking activity of all this summer was Tech-Free Day when we took away all the computers on one Friday each month over the summer! Jaws dropped, but no tears were shed and parents enjoyed some quality time with their children playing board games and reading together. 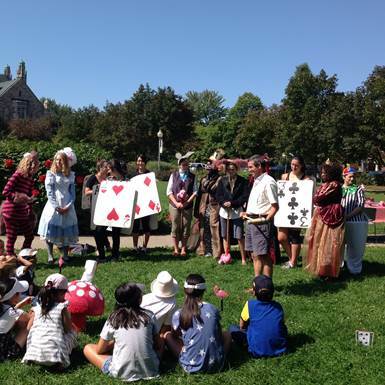 Croquet and a Mad Hatter Tea Party in Westmount Park next to the library. 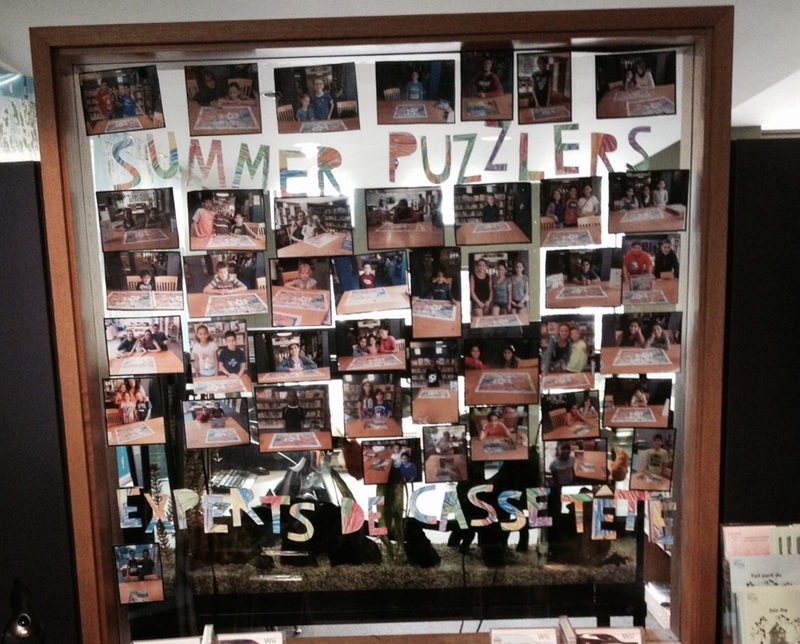 So why do children’s librarians go through all this work every summer? Because we know that it makes a difference to the children in our communities. We put the extra time and effort into developing a fun summer reading club because we want to foster a love a reading that will last a lifetime. We want the children to feel comfortable in our libraries and to experience that magic moment when a story transports us to a different world, full of possibilities. We also want to reach out to those children who might think that they don’t like reading, but we all know that they just haven’t found the right book yet. The children’s staff love to book talk and recommend great reads to the children and summer is the perfect time to try out new books and share titles! Our TD SRC closing party – 250 kids and parents participated! Even though it is autumn, I am already thinking about next year’s summer reading club and I am sure that most other children’s librarians are doing the same. Maybe it is time for our adult department to get into the summer spirit and develop a summer reading club designed just for adults! Happy reading and don’t forget to celebrate Alice’s 150th anniversary this year! We are so excited to share our first guest post from Manitoba! As part of our Canadian Libraries Spotlight series, we’re highlighting the outstanding work being done in Canada to serve children and families. 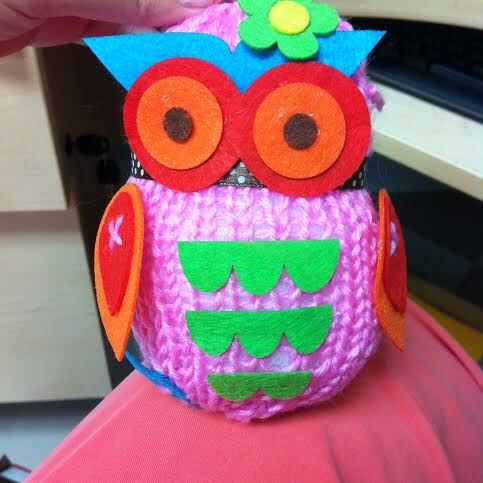 This week we’re learning about the amazing mobile makerspace programming happening at the Winnipeg Public Library. 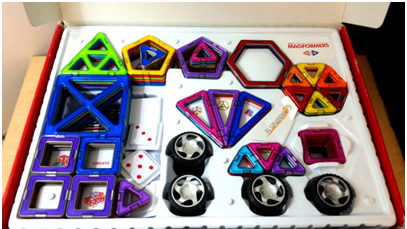 Megan O’Brien, a youth services librarian at WPL, gives all the details about the five makerspace programs they developed for tweens. No doubt by now you’ve seen some of the amazing makerspaces – physical locations dedicated to creating, making, learning and experimentation. 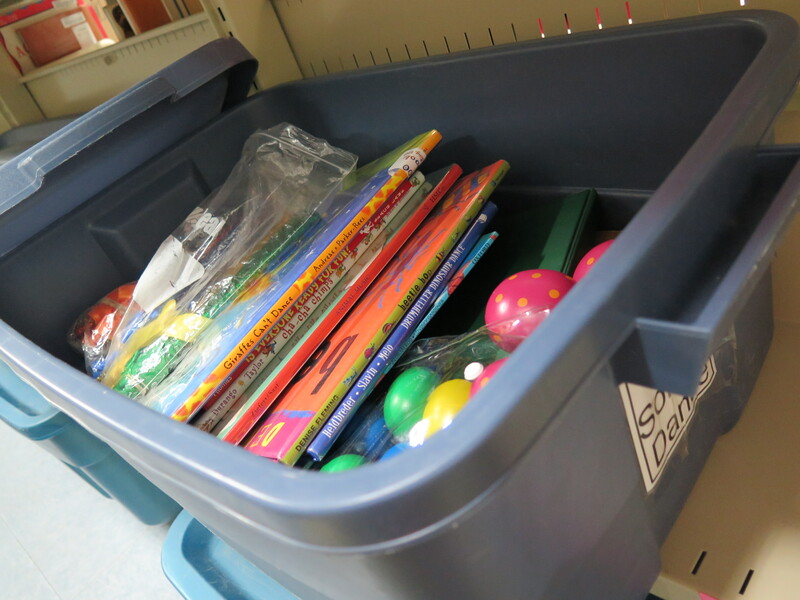 At Winnipeg Public Library, we have taken a mobile approach to makerspace programming. Programs are centrally developed and curated, and the kits are then requested by and sent to any of our system’s twenty branches. Once the -40C degree weather hits, program registrants will only have to go as far as their neighbourhood branch to participate in quality makerspace programming, rather than travel through the snow across the city. This approach allows us to provide users all over the city with access to a wide variety of tech- and craft-based programs. Another benefit of the mobile makerspace has been increased opportunities for staff to provide input regarding the programs we run. Programmers are invited to follow the included program outline when they receive the kit, but are also able to tweak the program to suit the needs and interests of participants. 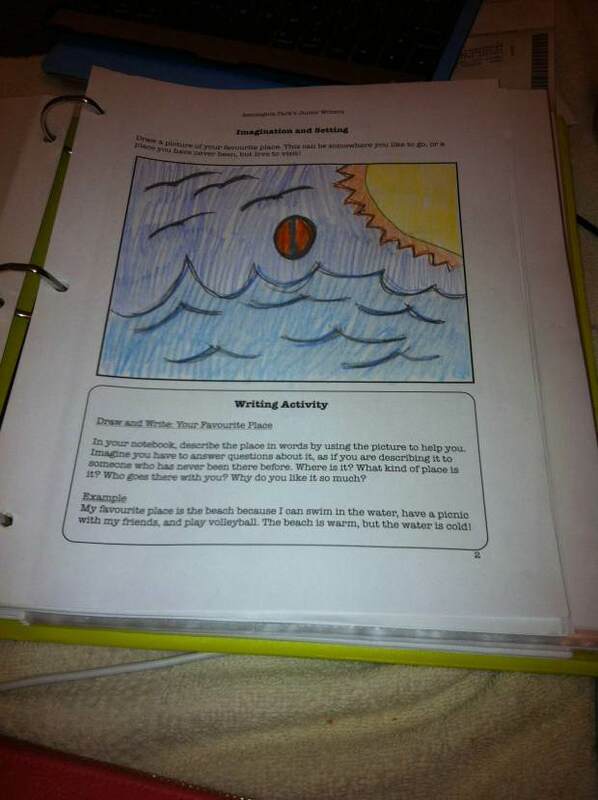 They then provide reports outlining what worked, what didn’t, and how the program was received by participants. This is a great way to keep branch staff invested and involved in the programs, and to ensure that our programs are meeting the needs and interests of our community. This summer, we debuted five new makerspace programs for tweens: Making with Minecraft: Treehouse Challenge, Making with Minecraft: Papercraft, LEGO Story Makers, Cubelets Robotics, and Making with Magformers. Making with Minecraft: Treehouse Challenge is a tech-based program using a 12-unit Surface Pro lab. Participants can work in teams or on their own to build a treehouse in a closed-world Minecraft environment, which is monitored and run by the program facilitator. At the end of the program, participants show the rest of the group what they built. We weren’t surprised when the program filled quickly, but since the waiting list also filled almost immediately, the decision was made to run the program again, to meet customer demand. A successful program is more than just full registration; however, and I am pleased to say that throughout the entire three hours of the program, the tweens shared ideas, tips, triumphs and struggles, and took a genuine interest in the builds of other participants. When a question had them stumped, it was time to do some research! 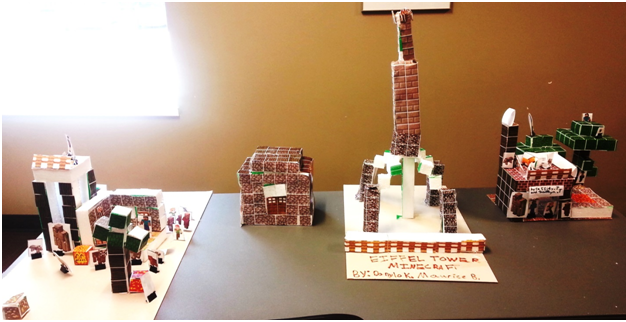 The Minecraft books displayed in the program room were a great resource, and the internet helped with the questions that weren’t answered in the books. The tweens completed some very impressive treehouses over the course of the afternoon, and one comment that appeared on all program evaluations was “have a longer program next time!” I guess they had fun! Making with Minecraft: Papercraft took Minecraft building off the computer and onto the table in front of participants, who were divided into groups and given a set of cubes to build creatures, scenes, or buildings. Once the base of the build was complete, they could add papercraft components such as creatures or decorations such as torches, doors, fences, and even beds and cake, to complete the look. This program originated as a one-off event run by a branch staff member, and used pre-cut Styrofoam cubes as the basic building form. To make the kit components more reusable and longer-wearing, it was decided that the reusable mobile kit would instead use plastic snap cubes. The pictures below are pattern-covered Styrofoam blocks, held together with tape. Participants can work alone, or in teams. This program kit shipped out mid-June and was in constant use over the summer, only arriving back at the program coordinator’s desk in the third week of September. 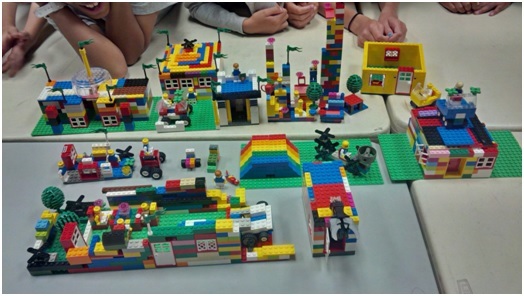 The bright colours and ease of use make this program appropriate for our 6-8s, as well as our tween demographic, and it never seems like there is enough time for the participants to do all the building they would like! 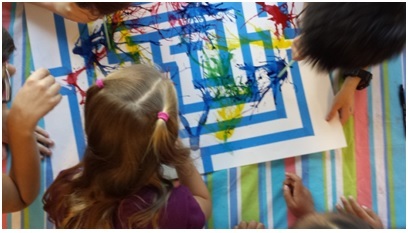 The other new-comer tween program this summer was our Cubelets Robotics program. This program allows participants to explore some of the ways in which robots think, sense, and act (three key qualities for a machine to be considered a robot). The kit comes with LEGO® brick adapters, so once the tweens have had a chance to test the functionalities of different cubes, such as the distance sense cube, flashlight action cube, brightness sense cube, or inverse think cube, they can work on building their own robot, capable of thinking, sensing, and acting. The interactive exploring and experimentation involved in this program brings a lot of creative energy into the room, and received many positive comments and requests for more this summer! Below is a picture of a Cubelets flashlight using the flashlight cube, the light sense cube, and a battery cube. Currently waiting for its first public run is the Duplo® Story Maker program for parents/caregivers with children 3-5 years. Similar to the LEGO® Story Maker program, Duplo® Story Maker is a fun way for young children to develop their storytelling skills by building scenes using the Duplo® blocks and the background scenes that come with the sets. Winnipeg Public Library began developing its roster of makerspace programs in 2013, and the number of maker programs has risen steadily to now include 5 adult programs, 6 teen programs, 8 tween programs, 3 school-age programs, and 1 pre-school program. 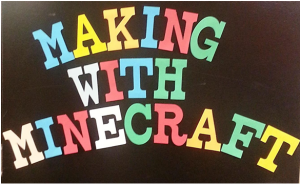 The Makerspaces Programming Working Group is always looking for ideas for new programs, especially for younger children, and are excited to see what our next mobile makerspace program will be! 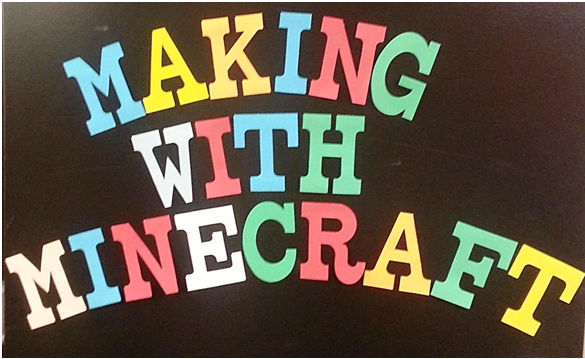 At Winnipeg Public Library, our goal with makerspace programming is to encourage excitement about and experimentation with learning by providing access to technology and materials in such a way that participatory, collaborative learning can occur. Along with strengthening reading, sequencing, storytelling, and social skills, these programs offer participants an opportunity to engage with multiple literacies. These can range from computer and technological literacy to information, visual and digital literacy. This approach encourages “outside the box” thinking by providing participants a framework in which they can safely try new things, without fear of judgement, thereby increasing the potential for innovative knowledge creation, as opposed to simple knowledge consumption. By supporting the development of transferable skills and bringing together community members in a fun and positive environment, library branches become a destination of choice within the community. Makerspace programming is an investment in our community, and is a valuable addition to the traditional programs run at Winnipeg Public Library. The programs I’ve outlined above are just a few of our offerings, a list which will continue to grow to meet the needs of Winnipegers throughout the city. We are thrilled to bring you the 12th post in our Canadian Libraries Spotlight series from the small but mighty Cumberland Public Libraries in Nova Scotia. Feeling behind? Check out past posts. Feeling inspired? Submit one from your corner of Canada! Now, we’re going to sit back and listen to Jenn Atkinson share about an incredible community partnership she’s been working on. Cumberland Public Libraries is the smallest library system in Nova Scotia. We serve a large geographic, but sparsely populated, area. Our 26 employees, 7 branches and Borrow by Mail program serve a population of about 31,000. As a rural librarian with a small staff and budget, community partnerships are a boon. Partnerships can give you access to more ideas, staff and resources; they can take your programs to levels you couldn’t achieve on your own. CPL has a long-standing partnership with Maggie’s Place, our amazing local family resource centre. 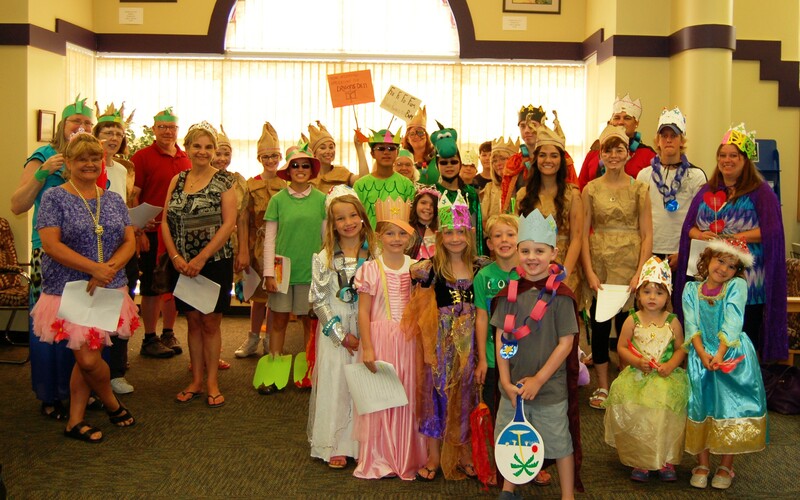 Every Wednesday for the last 10+ years, the Amherst branch has hosted Once Upon a Time, a 1.5 hour-long program for ages 0-5. An employee from Maggie’s Place and the Youth Services Librarian sing songs and do action rhymes, read a story, and deliver a snack. It’s a fabulous little arrangement: the library provides the venue and story, while Maggie’s Places brings the songs and snack. It’s easy to execute and we consistently draw anywhere from 30-60 people (children and adults) per week. This spring I proposed an expanded partnership with Maggie’s Place. The main impetus was to improve our summer program attendance, specifically in Amherst. There are several organizations in our community that offer summer programs to children, but with a population of 9000, there are only so many children to go around. Since we target the same youth population as Maggie’s Place, I wanted to work together this summer to maximize our programming. In April, the Deputy Chief Librarian and I set up a meeting with the Executive Director and one of their early childhood educators. We went in with three program ideas, and to our happy surprise they readily agreed to all of them. They loved the idea of increasing our partnership and were as keen to work with us as we were with them. Summer Storytime – Last year I held a weekly storytime in a local park without knowing that Maggie’s Place was also doing an outdoor storytime. This year we combined our storytime forces and held weekly 1.5 hour programs in 4 Amherst parks on a rotating schedule. In the event of rain, the Amherst Library was the storytime venue. I planned the half-hour story segment while Maggie’s Place staff planned our outdoor games and brought snacks. My storytime attendance increased by 11% from last year, and together we were able to offer a longer program with more engaging activities. 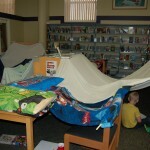 Family Fort Night –I’d wanted to do this program since reading about it on Tiny Tips for Library Fun, but never tried it because I was too worried that no one would show up. I find family-oriented programming to be challenging in Amherst, especially in the evenings. I hoped that our partnership with Maggie’s Place would draw in families who use the centre, but might not normally visit the library (as is often the case with Once Upon a Time). We had 22 people show up, which I consider a huge success for a beautiful July evening. 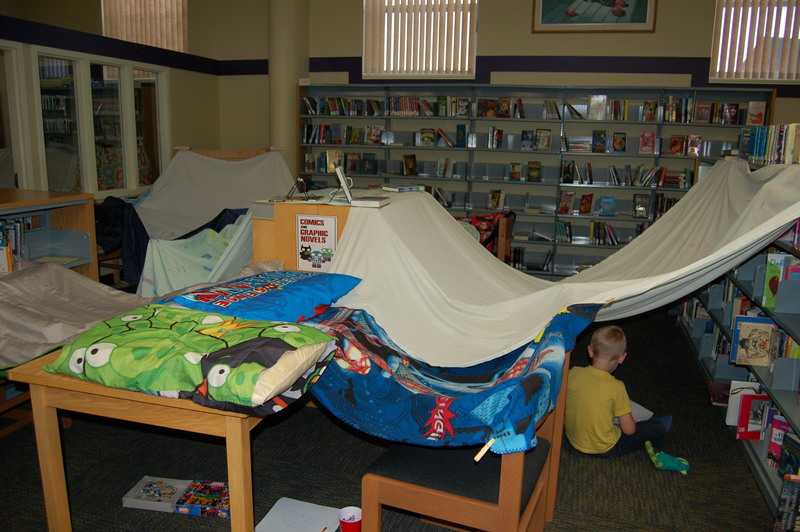 We invited families into the library with pillows and blankets to make reading forts in the library. 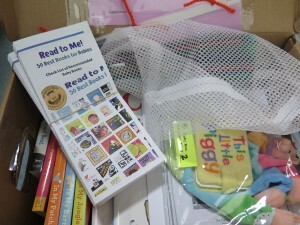 We provided books, games, puzzles, and colouring sheets to occupy the kids when in their forts. After reading and playing in the forts, everyone gathered around a fake campfire, ate a s’more treat, listened to stories, and finished up with hide-and-go-seek in the dark. Every kid who attended had a blast. 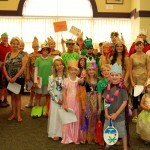 StoryMob – This Paper Bag Princess-inspired flash mob was the crown jewel of my summer programming. It was by far my most ambitious undertaking and I couldn’t have done it without the help I received as a result of this partnership. I was responsible for promotion, volunteer recruitment, and script direction, while Maggie’s Place took on the vast majority of craft and prop making. We were fortunate that Maggie’s Place lent us 2 staff members for the crafting session the day before, and 3 for the StoryMob itself. In all, we had 30 volunteers, 80 spectators, and a ton of fun! Start early – Don’t ask an organization to work with you a week before your planned program. They will probably say no, even if it’s something in which the organization would have been interested. Like us, Maggie’s Place plans months in advance, so we were sure to meet with them in early spring to propose our summer partnership. This allowed ample time to advertise our programs in their flyer and make the appropriate staffing arrangements. Communicate – Be clear about what you expect from your partner organization; they don’t want to be caught off-guard by unanticipated costs or staffing needs. I recommend a meeting (either in person or on the phone) to establish your partnership, and another the week leading up to your joint program/event to make sure everyone’s on the same page and ready to go. Appreciate – Like in any good relationship, be sure to let your partner know how valuable they are, and thank them for helping you accomplish more than you could on your own. Our expanded partnership with Maggie’s Place has been highly rewarding for both organizations, and we already have plans to continue working together throughout the fall and winter. They readily agreed to another Family Fort Night in late October, and we are talking about organizing another StoryMob in January. In addition to repeating two of our successful summer programs, I will perform a puppet show at the centre in December, and I will represent CPL at their popular Family Days that happen throughout the year to celebrate Halloween, Christmas, Family Literacy Day, and Easter. At these events I will do library card registration, check out books, promote the library, and be on hand to help Maggie’s Place staff. I strongly recommend developing a partnership with your local family resource centre, or other youth-oriented organizations in your community. In my experience, it has been positive and productive endeavour that has raised public awareness of the library and taken my programs to an exciting new level. We are so excited to feature the Ottawa Public Library in our 11th post in the Canadian Libraries Spotlight. Need catch up on our series? Here are all the posts. 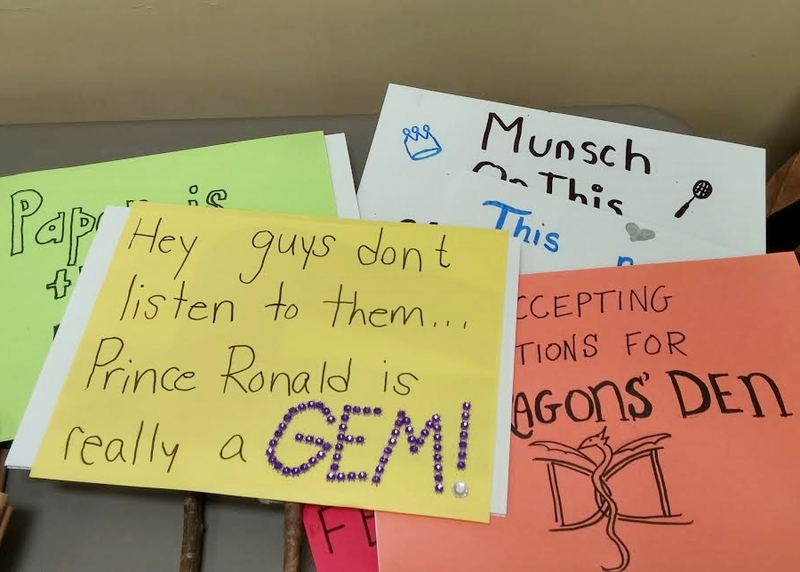 This post was written by Kirsten, Lise, Angela and Jessica , current and past members of the Children’s Services team at the Greenboro branch of the Ottawa Public Library (OPL). Take it away, ladies! Hello and bonjour from Canada’s capital! One of the most exciting things about life in a library is that you never know what to expect, and each day has its own new adventures to be experienced. 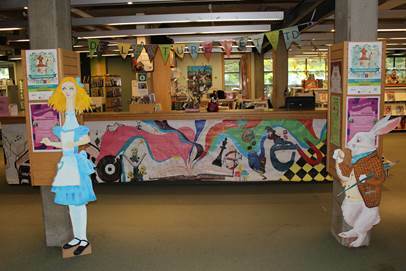 We feel very fortunate to be part of OPL and we would like to give you a glimpse of what life in the Greenboro Children’s Department looks like. OPL is the largest, officially bilingual (English and French) library system in North America and serves a population of approximately 870,250. Our branch is one of 33 branches scattered throughout the city. We also have two big Bookmobiles and a new Mini Bookmobile. Without a doubt, Ottawa is a very diverse city. As such, OPL offers material in 13 languages including Arabic, Chinese, English, French, Hindi, Korean, Punjabi, Persian, Russian, Somali, Spanish, Urdu and Vietnamese. Being the capital city also means that we are lucky to have a wide range of museums, both national and local, on our doorstep. What’s more, OPL has partnerships with most of them. Therefore, our customers enjoy free museum admission passes for the whole family to places like the Canadian Aviation and Space Museum and the Canadian Children’s Museum. Furthermore, employees from many of the museums often come and do programs at the Library. OPL is also very proud to have a Makerspace, called the ImagineSpace and a Kiosk that has automated holds pickup lockers and vending-machine style library material dispensers. 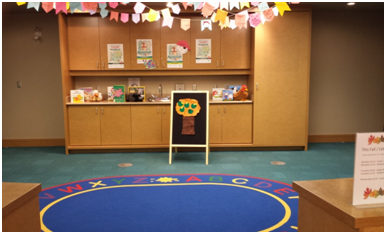 The children’s department at the Greenboro branch features an integrated program room, a lot of natural light, bright colours, and space to play and learn. Join us as we take you on a tour of the children’s department. 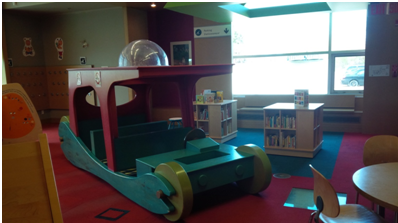 The absolute star of the Children’s Dept is our Flintstone style car; it’s the perfect spot for reading. It has two openings at the top with Jetson-style bubbles. It has generous front and rear trunks – perfect for kids to load up with books… much to the chagrin of our Pages! The pod area is where all the action happens. And, by action, I mean all of our preschool and class visits happen here. We call it the pod as it’s semi circular with a sturdy accordion curtain that closes to provide more privacy when needed. Hidden behind a series of moveable panels, are handy storage cupboards with a sink and countertop. Most of our supplies are kept here and the sink makes cleanup after a messy program easy. Kids and adults alike get a kick out of finding out that we have a Harry Potter cupboard, offering more storage under a set of stairs (of course) near the pod. 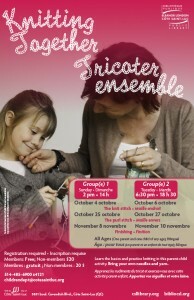 Between Babytime, Toddlertime and Contes en famille (that’s French for Family Storytime! ), to mention just a few programs, we see lots of families and caregivers each week which makes for a vibrant and noisy branch! We also have a special relationship with a local school for students with profound or multiple developmental delays, the Clifford Bowey Public School. 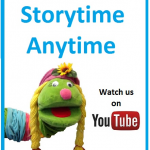 We offer four Storytimes, for many of the classes, per year. 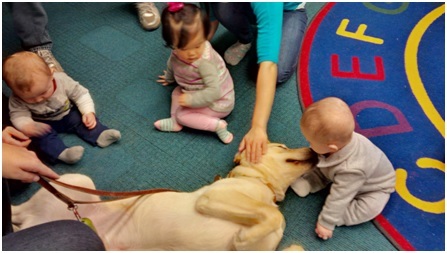 Due to the unique needs of this group, we creatively adapt Storytime to meet their needs. Each session involves some combination of books, rhymes, songs, felts, puppets and ends with a short video, usually one of the Weston Woods series of picture book films. Reading books at a toddler or pre-school level with a lot of animation. These programs are a 45 to 50 minute workout where the animator is in constant motion. Even while reading we move along in front of the group to keep all engaged. They are exhausting, but highly rewarding. As in any facet of life at the Library, communication is key. To improve our services, we will often discuss songs, rhymes or books we tried during the program, to evaluate those that were successful, or those that flopped, and keep track of the videos and books we share with classes to avoid repetition. When the class breaks out in an impromptu dance party. In the spirit of sharing, a favourite CD of ours (which has found its way into many programs) is The Second Line by Johnette Downing. Her songs Shake Your Scarves and Flitter Flutter have become favourites for the children, aides and teachers of Clifford Bowey and beyond. Please stop by and say ‘hi!’ or ‘bonjour!’ if you’re ever in town! It’s the 10th post in our Canadian Libraries Spotlight series, hooray! If you’re just joining us, we invited library staff in Canada who serve children and families to write about the awesome work they are doing. 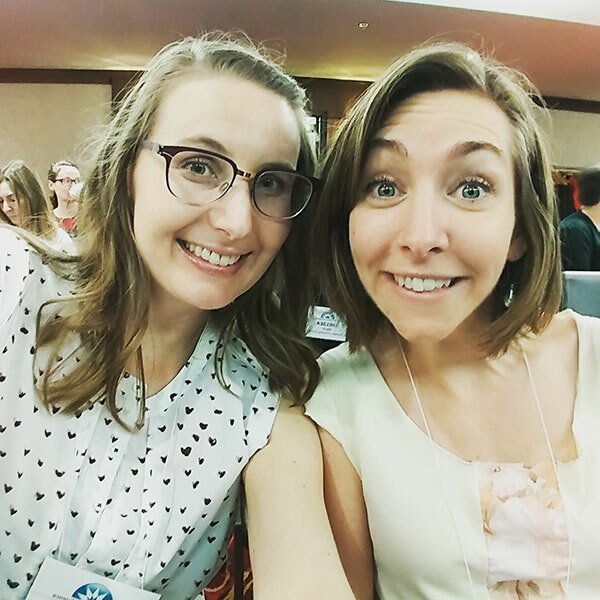 This week our guest blogger is Chelsie Abraham, the Acting Associate Branch Librarian with Richmond Hill Public Library’s Oak Ridges branch in Richmond Hill, Ontario. She also blogs about library services to children and young adults over at Rock the Library. Check her out! She’s here to tell us about developing programs on a tight budget. Let’s face it, not all of us have an infinite programming budget. Pressures to increase program attendance paired with the high cost of makerspace gadgets, small-to-medium sized libraries have to think outside the box. My first contract as a Children and Young Adult Librarian was at Windsor Public Library’s Remington Park branch in Windsor, Ontario. Programming budget for this 1000 square foot branch for the entire year was a whopping $100. And that included summer reading! We were open 3 days a week, and we had a program scheduled everyday. Sometimes even two. We had higher program attendance than all 5-days a week branches and were neck-in-neck with the largest central location. So, I’m here to show you that the feat is not impossible. An easy program to run in the fall/winter. Spool knitting is simple to learn and teach. There are a ton of free critter and monster patterns available on Pinterest too! Optional: If you have access to a 3D Printer, have crochet hooks made! To make the spools, glue the nails around the spool evenly with either a hot glue gun or industrial strength glue (E-6000 works best). A weekly program to run throughout the school year. What you Need: Shop back-to-school sales to get the biggest savings. Give yourself lots of time to prep for this program. Exercises can be as simple as developing a character and then writing a letter to that character to writing a myth or a legend. Invest in reusable supplies. Some supplies such as the 1-gallon of Elmer’s Glue may be an expensive start-up, but is reusable. Try to laminate everything. If you don’t have access to a laminator, ask your local school board to do it for you. 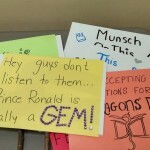 Tip: Offer a school visit in exchange for lamination. It’s a win-win for everyone! Ask your manager to view an office supplies catalogue. Libraries get mega discounts on their office supplies – sometimes up to 60% off the store price! It’s a great place to get construction paper, glue, and even a case for your iPad! Ask to have a programming account set up if they’re worried about budget allocations. Sales, coupons, and bargains. Back to school supplies are not just for kids! Pencils, lined paper, duo-tangs, and pencil crayons all go on clearance the first week of September. Freshen up your supplies for the entire year. And let’s not forget Michael’s coupons. Never shop without one! Sharing is caring. If you work in a multi-branch system, ask one of them to go halfers with you on supplies. It doesn’t have to be dollar store craft supplies. It may be $1, but not the best value. If you’re buying in bulk, sometimes it’s better spend a little more. A big thank you to Chelsea for sharing her budget friendly programming ideas! Please leave a comment with any tips or tricks you use at your library. 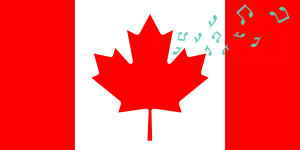 Welcome to the 9th post in our Canadian Libraries Spotlight series! If you’re just joining us, we’re highlighting the amazing work being done in Canadian libraries in the field of youth services. This week our post comes from our fairy godmother Angela Reynolds who works at the Annapolis Valley Regional Library in Nova Scotia. Read on to learn about StoryKits, Baby Boxes, and Be Fit Kits! Kits and bags and boxes, oh my. Enter the StoryKit! 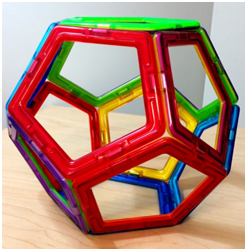 In my previous job at WCCLS we had a huge store of these kits, which is where I got the idea. I like to think of these as a “Storytime in a Box” – open it up and add kids, and you have yourself a storytime! Currently, we have 11 kits for staff use. I try to add one or two each year, to keep things interesting. 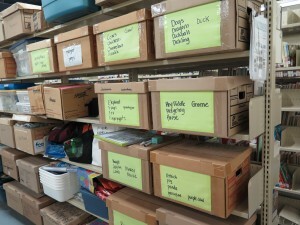 Each kit is stored in a Rubbermaid tub, and labeled with eh kit name and number on the outside. They are delivered along with books to our branches. The kits contain books, felt stories, active play items, puppets, and a resource notebook that contains craft ideas, fingerplays and songs, and early literacy information. Each kit is themed. . I always suggest that those who are new to storytime use these kits for their first session of storytimes, just to get a feel for the types of books and activities are in a good storytime. The kits all have an ECRR focus, and contain Early Literacy tips for the presenters. To give you a better idea of what is in a kit, here are the contents of our “Song & Dance” kit, which gets used a lot! I recently created Baby Boxes for baby & toddler storytimes. 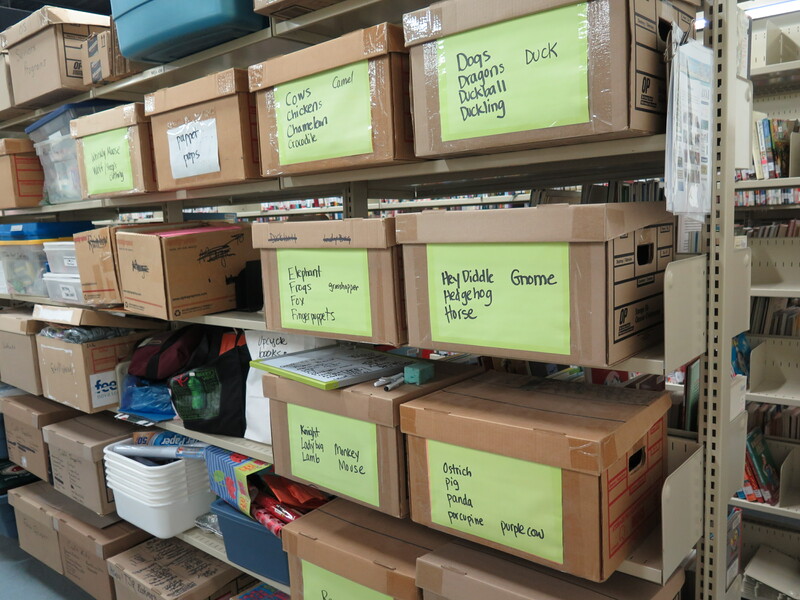 These are boxes that stay at the branch while they are doing Baby Storytime, and they include new board books, scarves, resources, and a hand puppet. We also have a large puppet collection that branches can borrow. I try to buy quality puppets from FolkManis, but we also have some nice puppets that have been donated. We keep these kits and puppets at our Headquarters location, and branches schedule them as they need them. This cuts down on branch storage issues, and allows us to do some resource sharing. We also have kits for public use. I know that parents are often looking for information on a subject or for books of a certain type, and so we’ve made it easy to grab and go! 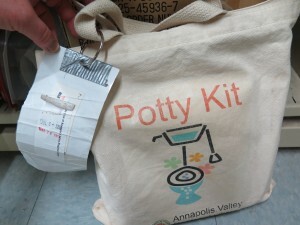 Our most popular are the Potty Kits – again, an idea I stole from my previous job. The Potty Kits contain – Everyone poops by Gomi – No more diapers for ducky by Ford – Potty Power DVD – Potty Time by Paterson – The Potty Training Answer Book by Deerwester – Tinkle, Tinkle, Little Tot (with CD) – and Too Big for diapers by Barrett. 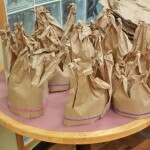 We also have “Little Reader Bags” – leveled early readers in a bag. These were so popular that we created them in French as well as English. Another kit that we have for adults is our Breastfeeding kits. These were created in partnership with the local La Leche League. Many of the kits for the public have been created with grant funding, and we update them with our own book budget when needed. Our most recent kit is the Be Fit Kit. We’ve partnered with Sport Nova Scotia and Department of Health & Wellness, Active Living Branch to create kits that you can take home and play with! Each kit contains fun items such as balls, juggling scarves, activity dice, frisbees, skipping ropes, and more! There’s an activity booklet included in each one that guides you in ways to use the items included. We’ve even included 4 picture books that will get you moving as you read together. The kits are designed to increase physical literacy and to make it easy for you to be active. Our kits are modeled on kits that were originally developed in Kingston, ON. While the kits can sometimes be a lot of work in the background for staff, for patrons they are really convenient and helpful. And our StoryKits are the same for staff—takes a bit of time to create them (but I love doing it!) and they are a big help to our storytime presenters.